I just logged in on the site with 50,066 words! Yay! I can't believe I thought I wouldn't make it this year- oh me of little faith. I'm actually quite please with my story as well, which I could say last year. I really know who my characters are and where I want to be going with them- I already have ideas for several more to create a series. I'm going to give myself a few weeks off before I start editing, but I am so pleased. I'm going to go bask in NaNoWriMo glow now, excuse me. I went on a rant this evening about how awful flowers are as a token of love. In a purely symbolic sense, it is very discouraging. For example, giving flowers to a dying relative: your relative is dying, so to cheer them up you give them flowers that have been cut off from their life source so that they can watch them whither and die while all their family stands around watching them (the relative) whither and die. I would be so annoyed. From an admirer I understand the deeper metaphor of a rose representing romance because they are beautiful, delicate, rare, and they hurt like hell. I have been given flowers once or twice and I appreciated the gesture, but I had to consider the other implications. Does the relationship, like the flowers have no "roots" or solid foundation? Will it be very pretty for a short while, then wilt and decay? Will all the petals drop off and reveal that all that's left is an ugly thorny stem of dead love? For goodness sake, I would say give me a living plant, so it can grow and bloom *like our love* (excuse, I just made myself dry heave a little). Please excuse my rant, I've had a migraine for three days. I've always wondered if my migraines are caused my me over analyzing everything, such as the symbolic implications of flower-giving. I'm almost caught up to my suggested word count! Now there are only about 8,000 words to go until I reach 50,000. Yay. I can't believe I was such a downer the other day. Unbelievably I still have a little bit of plot to write and have written very little word count padding crap so far this year. Truthfully, it was a gamble this year, I picked my plot only a week before starting but being a planner with a new story has proved to be better than last year's story even though the characters had been brewing in my head for a while- I was still mostly a "pantster" in terms of preparation. Yes, yes, I'll get back to my NaNo in a minute, but it's blizzarding outside so I can't go shoot my bow or take a walk around the cemetery to cheer myself up, this has to be it. It's a very silly interview with Matt Smith on Craig Ferguson's talk show (I'd never seen the show before this), about 10 minutes in he shows off some very nice dance moves. He also wears some interesting socks- I think his pant legs are a few inches too short, but oh well. This will, inevitably, eat my sidebar, but I think it's worth it. I'm closing in on the 35,000 word mark, but I'm still about 5000 words behind on the suggested daily word count. My confession is that I'm a little worried I won't finish this year. I know I felt the same last year, but I'm starting to lose a bit of steam. I actually do still have a few plot points left to hit, but the whole thing is very fatiguing. Tomorrow I'm just going to have to lock myself in my room with a pot of coffee. Sabrina’s eyes flickered up to meet hers, “I take it this is social?” she asked. “Well yeah, it’s called a date, I’m sure you’ve heard of it,” Jackie told her. “Heard of it, yes, of course. Fine. I hope you have a good time. Tell me if he says anything about the case,” Sabrina requested. “He won’t talk about the case, it’s a date. I’m not going out with him to spy,” Jackie explained as if to a child. “Yes, I understand that’s not the sole purpose- it can be a secondary benefit. Besides he might say something that doesn’t seem important but could be significant. In fact, perhaps you should just tell me everything he says so I can judge for myself,” said Sabrina. “I won’t remember everything he says,” Jackie said, slightly appalled. “Then maybe I should come along,” she said with a serious tone. “Could you perhaps record it then and make a transcript for me? You could omit anything too personal or that would seem like a violation,” she continued. “The whole thing seems like a violation,” Jackie scolded her. Jackie marveled at the fact that Sabrina seemed to be pouting, “Look, if he says anything important, I’ll write it down on a napkin or something, okay?” she said. Hey, that's the first NaNo excerpt I think I've ever shared. I'm still trying to think of a better name for the character currently called "Sabrina". I've been thinking of alternatives and visiting baby name sites. Back to the book. In light of the giant weight off of my shoulders with all papers complete, a reprieve from classes until Monday and little left to worry about until finals, I enjoyed an extremely unproductive afternoon. The weather was gorgeous, so I went on a long walk around town, but then decided to wander off by the creek in search of a good climbing tree. I haven't climbed a tree in ages and sometimes the urges of my tomboy childhood in the middle of nowhere return. My search didn't yield anything too promising, the best bet was in some one's yard and that just seemed mildly inappropriate and like it might alienate my neighbors. However, cutting up by the range at the sportsman's club (it was empty, I regretted not bringing my bow, I would have had perfect solitude to practice), I ended up below the cemetery. As I write this I realize it seems slightly creepy, but it was so quiet, I just lay down in the grass- not in the cemetery proper mind you- the sky was that shade of off white that is so common in autumn. Hmm... this whole scenario is sounding even more morbid. I couldn't remember the stanza exactly, but some of the words and their impression were floating through my mind. I do feel like perhaps I should watch Bright Star again now. Well to veer away from that, I should tell you I spent most of the rest of the day making things for my Etsy shop and listening to Pandora Radio. Because of my love of analyzing and debating (English major all the way) I am a member of online forums so that I can discuss some of my obsessions that are more obscure where I live. I've recently become a member of the "Sherlocking" forums and this afternoon I wanted to go waste a bit of time there. To my chagrin the site is currently disabled due to hacking problems. Many of the members are also bloggers, but they all belong to camp Tumblr. Curses to Tumblr and its ridiculous exclusivity- you have to be a member of Tumblr to follow or comment. I stitched over the top button hole on my coat with red thread. It's a long story, but it has a Sherlock significance. This has been an extremely long post. I'm going to go drink tea now. Ugh, looking at that photo has made me realize that I have really unattractive, ungainly hands. Well, I guess I should take 'hand model' off the list of possible careers now. Hooray! About a month ago I celebrated my blogiversary and according to my dashboard this is my 200th post. Thanks to everyone who has kept me going for all this time! I also find cause to celebrate the fact that I've finished all my papers. It has been rough completing four literature papers in two weeks while trying to keep up with NaNo, the paper and other homework but I have succeeded. The rest of my week is free from classes, so I can spend it catching up on word count. I also must finish my articles for the next issue of the college paper. For my section (Arts) I write a column about British pop-culture- cleverly entitled "Pop-Culture from Across the Pond"- and I've had a request to write my next column about the upcoming royal wedding. Not exactly pop-culture, but it suddenly has everyone interested in the monarchy, so I will concede to this request. My write up on the Katty Kay meet and greet as well as my opinions column will be going in this upcoming issue. So, I'm about 5000 words behind right now. Yes, that's disappointing, and yes, my characters have started to have conversations about my research papers, but I've managed to write a few quality passages that I can be proud of. I'm also proud of the fact that the second body did in fact show up around 25,000 words which was my goal. Wednesday and Thrusday I plan to spend my day off catching up on word count- I have off from school. I may even become ambitious and make scones. We'll see how the writing goes before I can determine that. The literature paper tally for the week is: 2/3. I just have to finish that darn third by Tuesday. Mr. Emerson kissed her [Meg]; and I thought that honor would make even matrimony endurable, for he is the god of my idolatry, and has been for years. A deliberate reference to Romeo and Juliet it would seem. She had a crush on Emerson- I laughed out loud when I read that. Her family was very closely knit with the literary community. When her sister Elizabeth (inspiration for Beth in Little Women) died, Emerson and Thoreau were among the pallbearers according to her journal. I had a great experience- remember how the other week I was geeking out over getting to interview someone? Well I did and that someone was Katty Kay. She's the co-writer of a book called Womenomics that discusses the ways women work differently than men and how they can chart their own career paths. She's also the Washington correspondent for BBC News. Need I explain my geek-out? Fortunately- and I say fortunately because it is an intimidating situation for a student journalist- some of the other paper staff came as well and everyone was involved in asking questions. It was my first press conference like situation and I think it went rather well. Ms. Kay is extremely friendly and personable, some of the other editors and I were able to talk with her at a reception afterwards. She is also extremely passionate about her book and what she does. She's a great role model for myself and all the other women on the paper staff because she has found a balance between having a family and having a career. She's also travelled the world and speaks several languages. Some reporters from other local papers came to watch us interview her and then ask her a few questions when we were finished. Afterwards one gave me his card and told me the paper he was there representing may be looking for a new stringer and I should look into it. That's great news. I'm really looking to start doing some freelance work, especially in the summers to start building contacts and honing my skills. I was extremely pleased that he thought I might have a shot at the job and I'll be making contact soon. Check out Katty Kay's interview on the Colbert Report- she handles him really well! Currently trying to finish "The Turn of the Screw" for my lit class. It's weird... very peculiar. A bit of a difficult text. My Troilus and Cressida research paper is actually coming along- I at least have a better idea of where it's going now. Very interesting getting into the "poets war" with Ben Jonson as a possible fuel to the satire of the play. I've come to think of T & C as a sort of anti-Romeo and Juliet. I took a break this morning and made a new batch of soap with my fabulous new fragrance oil, aloe, and activated charcoal. While it cooled I read some Sherlock Holmes stories (The Adventure of the Copper Beeches and The Bruce Parington Plans). By next year when season two arrives I'd like to have finished reading the original canon. I'm still on my NaNo prohibition, but have some ideas for when I start back up tomorrow night. As Allie, my boss on the college paper can attest, nothing calms me like men in wool. So, after adding a few hundred words to my story, instead of leaping into my research paper (Satire in Troilus and Cressida is due Wednesday!) 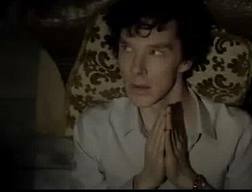 I decided to watch a Sherlock fan vid or two which inspired me to read "The Field Bazaar" and "How Watson Learned the Trick" by Sir Arthur Conan Doyle. They're actually parodies of Holmes and Watson that Doyle himself wrote. They are pretty funny. They're also very brief, so I then read one that J.M. Barrie wrote for Doyle when together they wrote the libretto of an operetta that was a total flop, it's about the two of them having a confrontation with Holmes and Watson and it's called "The Adventure of the Two Collaborators." Kind of... cute actually. Made me smile anyway. In another attempt to cheer myself and re-invigorate my writing I've decided to write scenes in my story that I didn't originally plan, but that I think would be fun. I wrote one yesterday that brought my protagonist together with her two equally strange and interesting siblings, just because I find their potential for interaction to be exciting. I did it in flashback so that it didn't change my plot. Next up on the frivolous scenes agenda will be one where the sidekick convinces my protagonist to go "clubbing" with her. Of course my anti-social misanthrope will try to gather clues and make this an experience that will help her solve the crime (and help me move the plot forward, ahem), but I just think it could be fun to see her faced with such an obnoxious situation and have her size up other people at the club. Best of all, I definitely think that I will go over 20,000 before introducing the next dead body... well not introduce, we've already met him, but you know what I mean. We haven't met him dead yet. Might not quite break 25,000 before he's found, but we'll see. I'm optimistic within reason. How's that for a qualifier? Well, tomorrow is home work day. While I'm at the laundromat I'll finish reading "The Turn of the Screw" and then when I get home I'll get on my satire paper- hopefully the other book I need will be in by tomorrow morning when I check. Saturday will probably be spent in shaping up said paper and maybe starting on the next one, a comparison piece. Ah, yes I still need to choose a subject for my third paper, I have two weeks on that one, but I'd like to at least know what it's about. Have I ever mentioned that I'm very bad at selecting a topic for research? Unless something jumps out at me right away, I just stumble around in the woods until I fall into a pit, then I stay and hang out. Translating my mental and emotional responses to a text into something I can research or write about in a scholarly way is difficult for me. This condition has swept the NaNo community, coming in to week two and worrying about holding up your plot while holding up your life. My word count is solid, but again, I'm going to have to back off this weekend because I have three research papers to write over the next week and a half and an new interp piece to get on its feet before the next Forensic Speech Tournament which is... oh yeah, just over a week away. Gah. I know I need to prioritize, but my novel is really important to me. I appreciate and enjoy my literature classes, but in the end I want to be a writer and I need to develop those skills. Not the essay and research paper writing skills, but the creative writing skills. There is no class in the program that actually forces you to write a whole novel- this is my independent study of sorts (if only I were getting credit for it). NaNo is probably more hands on training for a career as a writer than all my research papers because I really don't think I'm going to become a literary critic or professor or anything like that, I just don't think it suits me. I'm just annoyed and stressed. My Forensics coach told me to ease off on my novel and I totally get why he said so, but I really wish I didn't have to choose. I wish I wasn't so crazy busy. Sherlock thinks... and absorbs nicotine. 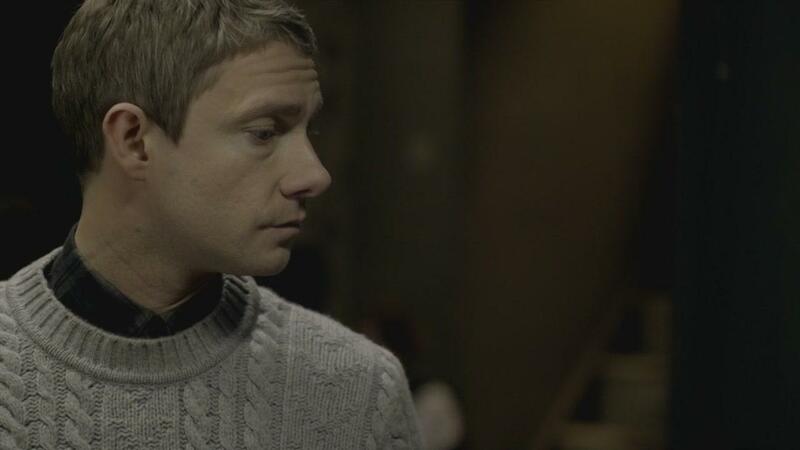 That John sure has a great sweater collection. Jeremy Brett!? No one invited you. Why can't JB just be content with being second sexiest Sherlock Holmes? Benedict Cumberbatch is not amused. Okay, that's out of my system. For now. I'm going to finish my apple and try to catch up on sleep, I'm at about 15,000 words. Rough seas ahead, I know this. Troilus and Cressida paper is proving to be troublesome as well. Ah, well, I'll get through. Probably. 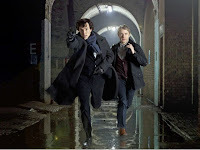 Gatiss and Moffat very cleverly made sure that fans would just be aching for a second season of Sherlock and demand the BBC bringing it back next year for another three episodes of fun and adventure. But, I'll come to the cliff hanger later. We begin with Sherlock in Minsk meeting with a potential client- it's very clear he stabbed his girlfriend in a fit of anger, no mystery there, so after correcting the man's very poor grammar (Sherlock Holmes correcting grammar, does it get any sexier? He gained major points in my literary crush scale for that one.) he takes his leave and finds himself at home, in his robe and so utterly BORED. So bored in fact that he starts shooting at a smiley face he's painted on the wall. Yet another reason Sherlock makes a bad roommate/tenant. Sherlock: "The wall had it coming." To his delight, however, he and John are soon off on a series of puzzles carefully crafted by an evil genius lurking on the sidelines. He gives Sherlock a time limit to solve a series of crimes and holds hostages which he will blow up if Sherlock goes over the limit. Another great Baker Street Irregulars reference in this episode with the "homeless network" of London being used by Sherlock to gather information. The assassin called "The Golem", was hiding out among them and he was so creepy. There was something very classic Holmes about him- I don't know, he had the right level of exoticism and sinister scariness. The fight scene with the assassin in the planetarium was slightly comical and very awkward. Not my favorite fight of the series, but oh well. Now for Moriarty. He only appears for about ten minutes in this episode and never gets any actual screen time prior to "The Great Game," but he is a major talking point for the whole series. I've heard many people that absolutely hate him, but something about him works for me. I still have one question (other than 'how will they get out of this one? ')- who left the phone for Sherlock? When he opens the envelope he says it's from a woman. Is that just a throw away line or Sherlock being mistaken? I doubt it, I think it might be significant. Is this man, Jim, a "sub-Moriarty," a minion, an assassin, a partner? Is there are female behind this? 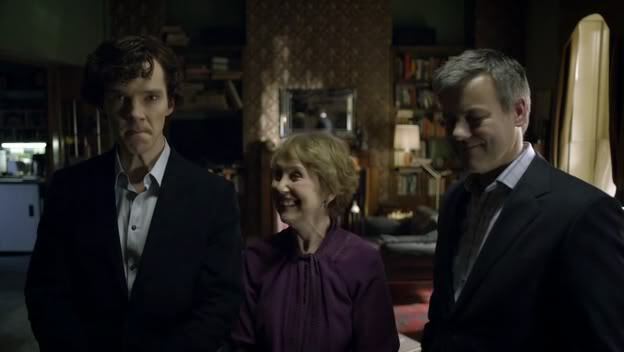 Moffat has promised that Adler appears next season, but would she be on team Moriarty? The 2009 film says yes, but only under duress. Well that's my clever thought for the night. I'm still behind on homework, and I haven't done much on NaNo this weekend, but I'm still on track numbers-wise. Tonight the Literary Society held a writing workshop. Our turn out wasn't spectacular, but it was better than expected. We all contributed writing prompts to a bowl and started the night by sitting around talking about what we're working on (or not as the case may be, then we pulled from the bowl of plots and took a minute to write a few sentences about it. One girl has obviously not been taking enough creative writing classes, she seemed liberated by the idea that an essay format was not expected. We all felt a little liberated actually. After the initial prompt exercise one of my friends and I excused ourselves to a separate "quiet writing room" to work alone. I brought my laptop and broke 10,000 words, my goal for the night. Later, when I got home I found I wanted to keep working and I've been writing for a little while now, breaking 12,000. There was a quotation by Geoff Nicholas I heard once that equates writing to drinking and I think it's always important to leave the table while you could still maybe write a little more. Sometimes if I let ideas and words fester for a little while it's easier to put them all down later. Surprises so far? I, the plotless wonder has actually constructed a pretty tight story (maybe a little too tight, so I still might have a little issue with word count). Some interesting gender dynamics have occurred unintentionally. My protagonist walks that fine line where she could either become a great force against crime or be quite a good criminal herself- she picks more pockets and locks than I originally anticipated. I like her though. She also reminds me a lot of her sister in some ways. Oh, yes, her sister. While I was plotting out my protagonist's back story (even if it won't all be revealed in this particular story I like to have it well fleshed out) and while I was wondering about her siblings a character from last year's NaNo (the only good thing from that story) burst in and told me she was my protagonist's sister. I'm unutterably pleased with this. I wasn't sure if I'd ever be able to use this character due to some botch-ups in last year's story, but she fits so well in this "world", family and genre I believe. Maybe she'll appear in the sequel. Now, it's two a.m., I must get to bed. I am also swearing off NaNo for the next 24 hours to catch up on school work. I'm at about 8 and a half thousand words, still pretty well on track, I have to take Saturday off from NaNo to catch up on papers for my literature classes (maybe next year I should independent study NaNo). So tomorrow I'll be catching up on some reading from said classes and then spending the evening at a writing night with friends upping my word count. The performing arts department at the college is doing an experiment where they are taking away people's cell phones for 24 hours and they're going to tally all the missed calls and texts that accumulate. My Forensic Speech coach was heading up the campaign, but I was holding firm because I have to commute and need to keep in touch with people for various projects. I'm not on my phone alot and I've unintentionally gone periods of time without my phone (left on the charger, etc), but with a long drive ahead of me tonight, I just didn't want to give up that security. However, I have the opportunity to interview someone in a few weeks (more on that later) and I like to be well researched on the person I interview. So, I have to read their book asap- my forensics coach happened to have a copy of that book. Basically, I had to exchange my cell phone. As I said to the other editors, "the things I do for the paper..." no one offered to give up their phone as a sign of solidarity. This interview is very exciting and intimidating, but I'm glad I get the chance to do it. It will look fabulous in a portfolio. I don't want to let out too many details at this time, but I should be able to post a copy of the final article here after it's in print- unlike some college papers, the school doesn't hold the rights to our articles, they let us retain them (thank you!) so it should all be on the up and up, but I'll make sure. Even if I listed the name of the person I get to interview, I doubt many would know it off the top of their head, but my excessive geekery makes this way better than interviewing a pop star or anything like that. More updates on NaNo and the paper soon. I just broke 6000 words, I'm about two days ahead on my word count and feeling pretty good. I'm already getting nervous about having enough plot though. I'm just over 10% into my story and I'm about to have the first murder, or rather the first body discovered. So that means that 80% of the story will be my hero team solving the murder/dealing with a few subplots I've come up with, leaving 10% of the story for denouement. That seems like a decent breakdown, but I have to think of a few more external roadblocks to delay my protagonist from solving the murder because I don't want her to be plodding along, unable to figure it out. 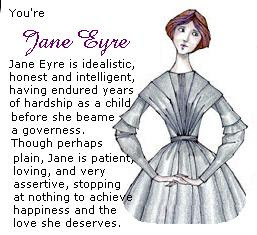 She has to be extremely quick, I see her as Holmesian figure (further explanation of her character is a few posts down under "National Novel Writing Month Preparations"), with a similar way of processing and using logic. However, in the character's timeline this is her first brush with solving a mystery and I've decided I really would like to write more stories about her and her sidekick that show her mature as a detective and develop in other ways as well- not all of them positive. I've decided that if I finish a bit prematurely this year, I can start working on the next story, I've already scribbled down a few ideas for future adventures in my notebook. In the editing process I can go back and bulk it up. Friday I plan on having some solid writing time while I sit at the laundromat, but Saturday I'm taking off from NaNo to work on my literary comparison paper due Monday and my paper on satire in Troilus and Cressida that's due the 17th. I need to bump that one up on my priorities list. When papers are assigned 5 or more weeks in advance it ruins my time budgeting. I always think I have loads of time. With a more constricted frame I am more aware of when I need to work. I think that's another reason why NaNo is a good exercise for me- in spite of the somewhat negative reputation it has in some circles, it can be the perfect impetus for you to finally finish something. I do believe that nearly anyone can be a writer, but that doesn't mean everyone should. Incidentally, according to a page about "Icons of England," Robert Louis Stevenson wrote Doctor Jekyll and Mr. Hyde during a six day cocaine binge. He probably would have loved NaNo, but it might have killed him if he were high for 30 days straight. Still, the point is that quickly written first drafts aren't always a bad thing, that's evidence of that. And no, I in no way advocate "writing under the influence" I'm just making a point. It's been going well, it will be Day 2 shortly so I thought I would write an encouraging post while things are still looking up. Today I wrote 3521 words, exceeding the 1667 word per day goal. I know there are going to be a few days this month where writing will be impossible due to mass amounts of school work, so on days I can write I'd like to exceed the word count goal as much as possible. In my preparations for writing about murder, mayhem and an annoyingly intelligent detective, I was reading a good deal of Arthur Conan Doyle over the weekend- and of course as you look down and see my review, I ended my weekend watching the second episode of Sherlock. I read "The Final Problem" and I can see why audiences were in a bit of an uproar, Doyle did not give a very satisfying conclusion to Holmes' story. It was ambiguous and somewhat anti-climactic. 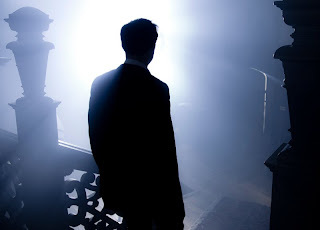 Moriarty was such a great creation as well (look at all the Sherlockian media he's inspired), kind of wasted on one brief story- though apparently in a post "The Empty House" story he is expanded on a bit. 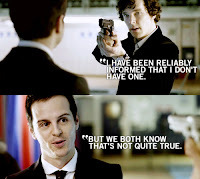 "All that I have to say has already crossed your mind," said he [Moriarty]. 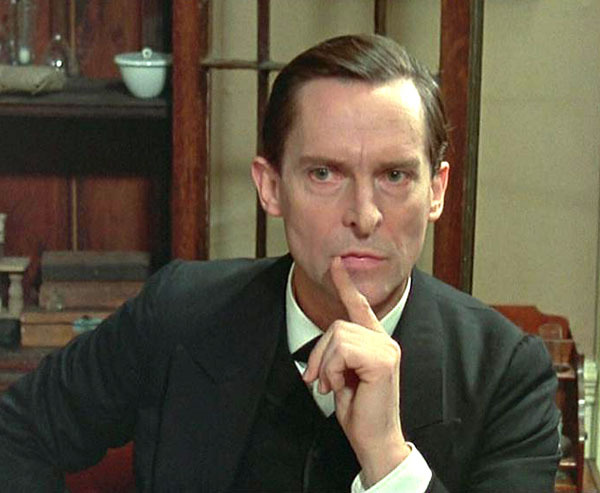 "Then possibly my answer has already crossed yours," I [Holmes] replied. This passage may be part of the wild speculation surrounding the third episode of Sherlock airing in the US next week on PBS. It certainly supports some theories, but could also be a ~red herring~ to throw our opinions in another direction, but I wouldn't be surprised if this passage is cited as evidence for certain theories regarding what's coming next season. According to Moffat the key words for Sherlock season two are Adler, Hound and Reichenbach.